LED grow lights are an increasingly popular choice for indoor plant growing. They deliver more intense light output with less energy and heat production. Compared to high pressure sodium, fluorescent, high- intensity discharge or incandescent lamps, they have a much longer life. Features: The grow light is well built and powered by a USB connection. 16 LED plant growing beads(11 red & 5 blue). Ultra bright, lower heat and lower power consumption, high luminous efficiency and long service life. FLEXIBLE Gooseneck. It is easy to adjust the light towards any directions if the plants need. Gooseneck Design: the 14" elongated neck is made of flexible, posable, stainless steel construction. This plant growing light gives off targeted wavelengths (460nm and 660nm) lights which can be fully absorbed by plants to help accelerate the growth of indoor plants, potted plants, foliage plants, flowering plants, succulent plants. 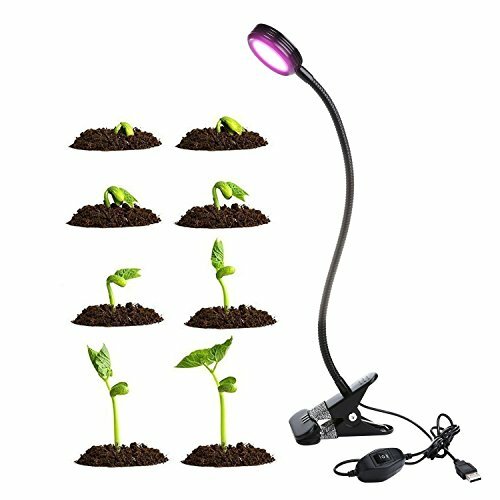 It can rapidly improve the health of plant and growing, generally leaves grooming within 2 weeks of using this growing lamp on a daily basis. USB connector, you can choose to plug into a wall outlet or an USB interface. Compact design, strong metal clip, 3 ways to fix the clamp (Clip, Screw or Stick). It can be placed anywhere you want to put. Easy to install at your home or office. Can be widely used indoor with a wide variety of plats.Easy to install at your home or office. Especially for OFFICE DESK PLANTS USE, convenient to operate. If you have any questions about this product by WONFAST, contact us by completing and submitting the form below. If you are looking for a specif part number, please include it with your message.